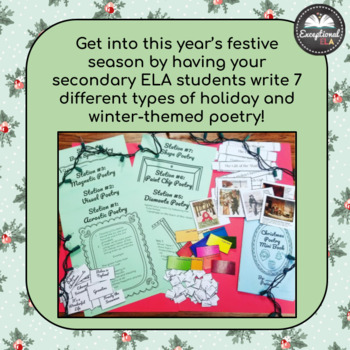 Get into this year’s festive season by having your secondary ELA students write 7 different types of Christmas-themed poetry! Instructions and manipulatives are included for every station for easy printing! 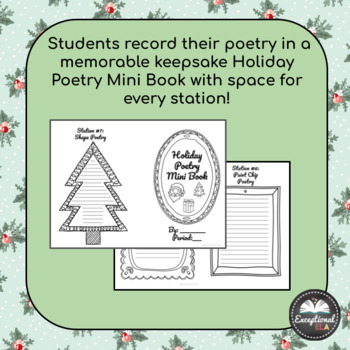 Students record their poetry in a memorable keepsake Christmas Poetry Mini Book with space for every station! 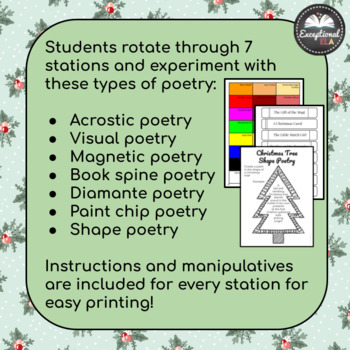 **Check out a preview of this resource by downloading FREE: Christmas Tree Shape Poetry! Check out my other Christmas resources! Ugly Sweater Pitch using Ethos, Pathos, Logos: Students design their own ugly sweater and write arguing why it's the ugliest one! Figurative Language in Christmas Songs Treasure Hunt: Students review figurative language in a get up and go activity! More Resources from Exceptional ELA! Halloween Poetry Stations: Get into the Halloween spirit by having students write 7 types of Halloween-themed poetry! 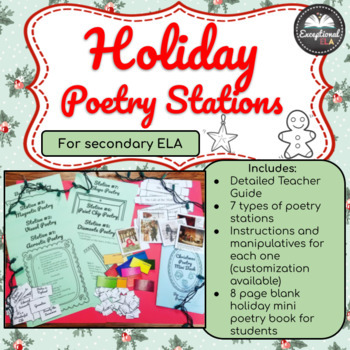 Valentine Poetry Stations: Have students write Valentine themed poetry in 7 unique stations! Literary Limericks: Get students excited about St. Patrick's day while reviewing common literary terms! Budgeting Board Game: Help students make their own financial decisions with simulated consequences! Editable Black and White Coupons: Incentivize positive student behavior in the classroom! Identifying Writing Types: Narrative, Explanatory, Argumentative: Help students review the major three writing types of the Common Core State Standards! Did you know that you can receive credit towards future TpT purchases by reviewing this product? If you enjoy this product, please leave a review at the product page or through “My Purchases” under “My Account” at TpT. Thank you!